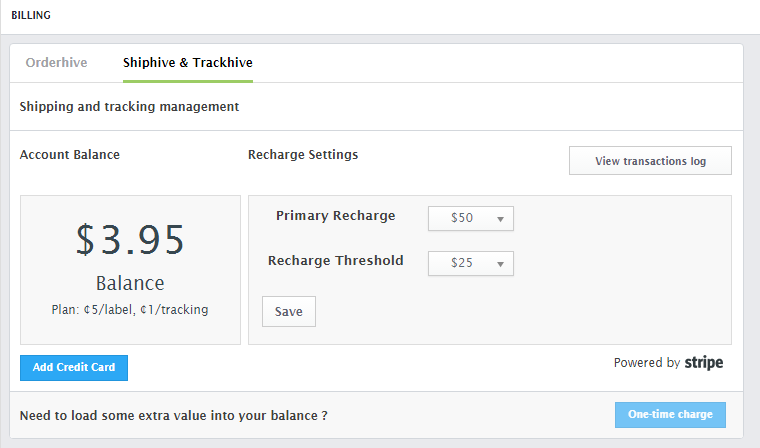 What is Shiphive and Trackhive, and why should I pay extra for it? Shiphive and Trackhive are shipping add-ons that enables you to print labels and track shipments within Orderhive. The charges to print labels and generate tracking are not part of the monthly subscription plan. Let say, you've two selling channels, Amazon and eBay. For shipping, you use UPS carrier. To add Amazon and eBay, you need to be on any of our paid plans. However, shipping carriers like UPS are not considered to be channels in Orderhive. To generate UPS labels in Orderhive, you need to add your UPS account and configure your credit card from the Subscription page. You can set the recharge value and threshold, and then click on Save. You may get error message "Not enough account balance click here to recharge your account", if you do not have enough balance in Shiphive wallet or credit card is not attached to your Shiphive account. This error will be resolved by adding credit card to your Shiphive account and loading initial balance using "One-time Charge" button.